Any time a reviewer goes to post their thoughts on a good Uwe Boll movie, they feel the need to address his previous critically panned movies that gave him the reputation as one of the worst directors ever. Unfortunately, this will always be a stigma attached to his name, due to the thousands upon thousands of film fans who dislike him on a personal level and are quick to bash his work before they’ve even given it a chance to prove them wrong. However, Uwe Boll is not a bad filmmaker; although he’ll never get the credit he deserves for his intelligence and talent, he’s a director who has made mostly good features throughout career, with only a few duds that have overshadowed them to earn him his the undeserved reputation of that of a hack. But those duds tend to still be entertaining. That being said, if Uwe’s movies were judged on the merit of each film alone, most of them would still divide opinion due to uncompromising execution of controversial subject matter. Take a movie like Auschwitz (2011), which was both praised and reviled for its unrelenting portrayal of Nazi atrocities during the Holocaust; or Attack on Darfur (2009) and 1968 Tunnel Rats (2008) for their cruel realistic depictions of war. Back in 2002, Heart of America bravely explored the subject of high school shootings with delicacy, honesty and grace to create a thought provoking, harrowing piece of brilliant filmmaking. Critics have been kinder to Rampage (2009) and its sequel Capital Punishment (2014) with its radical socio-political themes and mean spirited, darkly humorous, violent content, but it does have its detractors. Assault On Wall Street (2013) is another controversial feature which further proves Boll is a capable director; albeit one who isn’t out to please everybody, instead choosing to make statements about the state of the world. My point is: Boll is a talented filmmaker, but some of his movies are so bleak, nihilistic, honest, and at times – vicious, that they would never appeal to a mass audience. That’s a logical reason to dislike his movies; not the false assumption that they’re incompetent trash. This is the only time I’ll address Uwe’s negative reputation, because I feel he’s more than paid his dues. 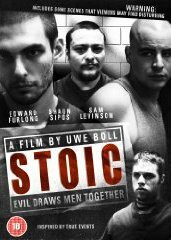 Stoic falls into the category of impressive, but polarizing; based on the true story of an event which happened in a German prison in 2006, where 3 inmates tortured their cellmate and forced him to hang himself, this a movie which addresses prison brutality in such an honest way it’s unsettling to sit through and disturbing to watch. The film begins with 4 young prisoners – Harry (Edward Furlong), Mitch (Shaun Sipos), Peter (Sam Levinson) and Jack (Steffen Mennekes) – as they play poker and share fun stories. Mitch then makes a bet where he’ll eat toothpaste if he loses the next hand; unfortunately for him that’s just what happens. Afterwards, he tries to back out of the bet, which angers his 3 cellmates. First they force him to eat the toothpaste, then things gradually grow worse until they spiral out of control. If you’re going in to Stoic expecting entertainment then you’ll find it sorely lacking; there is no safety blanket to protect us from the horrible acts as they transpire. If you choose to stick around, Stoic will punish you without mercy. It’s a cruel picture with believable performances from the actors, all of whom play characters whose only characteristics are loathsome or tragic. Furthermore, it’s not a pleasant film to look at, with its dimly lit rooms and dungeon-esque cinematography, it gives off a sense of claustrophobia and hopelessness. Here we are, watching the events leading up to a forced suicide we know is coming, endurance our only ally.